Just like physical clutter, any amount of mental clutter can slow you down in terms of productivity and also affect your positivity levels. If you too, feel stressed and are often hit by anxiety and worry and have a lot of mental clutter accumulated, here’s a little help. Discover some of the best actionable ways to clear your mental clutter and get some headspace to think and enjoy things that really matter to you. Decluttering is a no-brainer when it comes to looking for ways to clear your mental (and physical clutter). Doing it regularly can not just help you become more organised, but you’ll also be able to focus on your tasks better, and you’ll see your productivity and positivity levels increase. So whatever it is that’s stressing you out, get rid of it, toxic relationships, a career path or friends. Take a quick look at the things you do everyday and your predominant thoughts, more often than not, you’ll find yourself living more in the future and worrying about it, and that’s natural. However, make sure you do not postpone joy and forget enjoying the happy things in your present until you’ve crossed every ‘t’ and dotted every ‘i. Practising gratefulness on a daily basis has many benefits, and doing this everyday can have a magical effect on your life. Not only will it teach you to focus what is really important in life, but it will also help you get rid of those pestering negative thoughts. Simplicity is the key to living a good life. Set fixed goals for yourself, interact with people who make you happy and bring no drama into your life, and eat healthy. The less disorganised and easy going you are, the less mental clutter you’ll be likely to have. A simple fact that all of us need to understand is that it is impossible to keep everyone happy, and be happy yourself at the same time. If you’re one of those who try too hard to please everyone, you’re probably taking up more than you can handle, and saying “yes” to things you can’t do. Remember that it is okay to say no sometimes. Paying attention to yourself and practising self care is another great way to rid your mind of all the clutter. Taking your time to eat healthy, get a good night’s sleep and exercising everyday can keep you in the best of health, and it will ultimately affect your mental health as well. Every once in a while, pamper yourself and give yourself the chance to relax and take a break. It will leave you feeling invigorated both physically and mentally. Love this post. I think it is so important that we take care of ourselves. 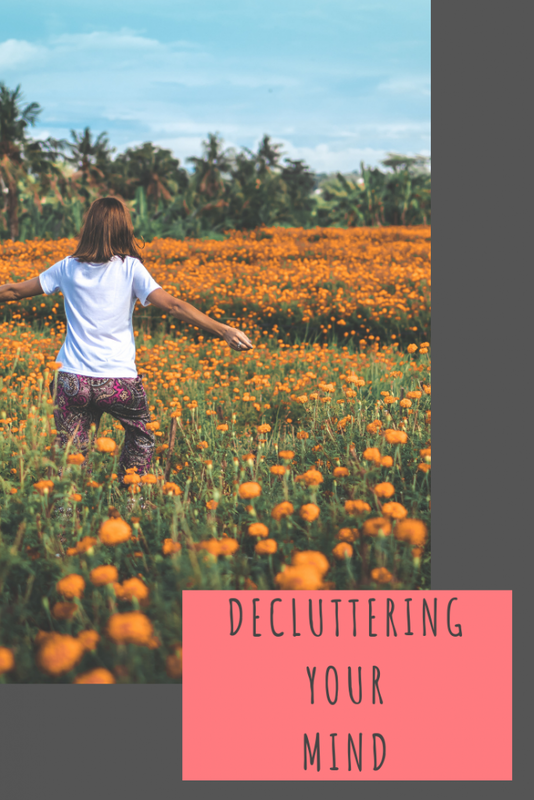 Decluttering is a great place to start! I always feel so much better once I have gotten rid of things I never use! Great insight. I think its so easy to always want to say yes that we take on too much. I’ve started saying no a little more. I love these tips. Thank you for sharing! I definitely feel like I don’t relax or get enough sleep personally! I am terrible for pushing myself too much too! I started saying No last year and I never looked back. It really helped with my social anxiety.